They amaze the crowd with shocking stunts that hit every time, along with tumbling that makes the crowd go wild. After practicing tirelessly for long hours, the coach smiles as she realizes that their hard work is paying off. Seeing the team’s determination, she feels accomplished. Between the sweat and the strain, these moments of success come through in just another day in the life of a cheer coach. Trying to balance the life of a mom, wife, business owner, and cheer coach is hard work. This challenge is not beyond the capacity of coach Jessica Sanchez. At the age of eight, she started cheering in Pop Warner and continued in cheer through high school. She was not only involved with cheerleading as a kid, but she participated in gymnastics and karate. She definitely has cheer experience, since she cheered almost all of her life and is thrilled to bring that enthusiasm to University. 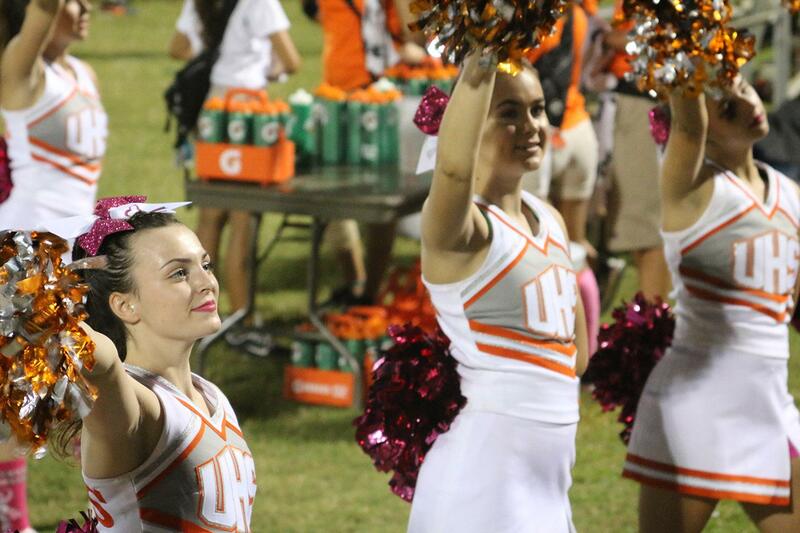 Not only does she want to want to commit, but she is willing to create new traditions that take cheerleading at University High School to a whole new level. Entering the 2017- 2018 cheer season with a new coach who is passionate about cheer is already a season that is off to a great start. Although, to have an amazing season it is going to take some blood, sweat, and maybe a little tears from everyone. She definitely is looking for a group of girls that want to work hard, but most importantly, have fun together as a team.